More than 50 students have come together to make this event a success. 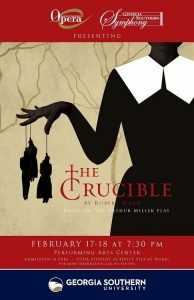 The cast, made up of 21 students, orchestra of 28 students and crew of 11 students, have been working on this production since October of 2016. Jonathan Murphy, DMA, has worked diligently with the orchestra and singers to prepare these difficult scores. In addition to the students, faculty member and alumna Jillian Durant will join the cast in the role of Abigail and guest tenor. Gregory invites any media or press to attend evening rehearsals this week. Full dress rehearsal will take place on Wednesday and Thursday. To learn more about the University ensembles, visit https://cah.georgiasouthern.edu/music/ensembles/.